21:1 When the Canaanite, the king of Arad, who lived in the Negeb, heard that Israel was coming by the way of Atharim, he fought against Israel, and took some of them captive. 2 And Israel vowed a vow to the Lord and said, “If you will indeed give this people into my hand, then I will devote their cities to destruction.” 3 And the Lord heeded the voice of Israel and gave over the Canaanites, and they devoted them and their cities to destruction. So the name of the place was called Hormah. 1And when king Arad the Canaanite, which dwelt in the south, heard tell that Israel came by the way of the spies; then he fought against Israel, and took some of them prisoners.2And Israel vowed a vow unto the LORD, and said, If thou wilt indeed deliver this people into my hand, then I will utterly destroy their cities.3And the LORD hearkened to the voice of Israel, and delivered up the Canaanites; and they utterly destroyed them and their cities: and he called the name of the place Hormah.4And they journeyed from mount Hor by the way of the Red sea, to compass the land of Edom: and the soul of the people was much discouraged because of the way.5And the people spake against God, and against Moses, Wherefore have ye brought us up out of Egypt to die in the wilderness? for there is no bread, neither is there any water; and our soul loatheth this light bread.6And the LORD sent fiery serpents among the people, and they bit the people; and much people of Israel died.7Therefore the people came to Moses, and said, We have sinned, for we have spoken against the LORD, and against thee; pray unto the LORD, that he take away the serpents from us. And Moses prayed for the people.8And the LORD said unto Moses, Make thee a fiery serpent, and set it upon a pole: and it shall come to pass, that every one that is bitten, when he looketh upon it, shall live.9And Moses made a serpent of brass, and put it upon a pole, and it came to pass, that if a serpent had bitten any man, when he beheld the serpent of brass, he lived.10And the children of Israel set forward, and pitched in Oboth.11And they journeyed from Oboth, and pitched at Ijeabarim, in the wilderness which is before Moab, toward the sunrising.12From thence they removed, and pitched in the valley of Zared.13From thence they removed, and pitched on the other side of Arnon, which is in the wilderness that cometh out of the coasts of the Amorites: for Arnon is the border of Moab, between Moab and the Amorites.14Wherefore it is said in the book of the wars of the LORD, What he did in the Red sea, and in the brooks of Arnon,15And at the stream of the brooks that goeth down to the dwelling of Ar, and lieth upon the border of Moab.16And from thence they went to Beer: that is the well whereof the LORD spake unto Moses, Gather the people together, and I will give them water.17Then Israel sang this song, Spring up, O well; sing ye unto it:18The princes digged the well, the nobles of the people digged it, by the direction of the lawgiver, with their staves. 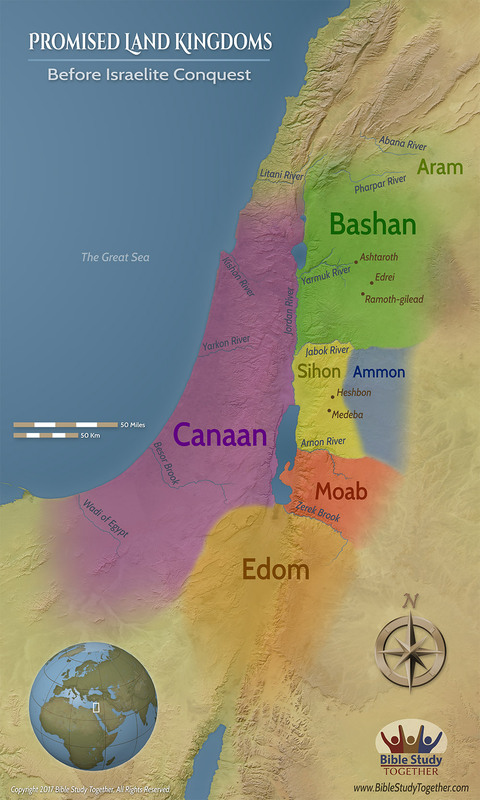 And from the wilderness they went to Mattanah:19And from Mattanah to Nahaliel: and from Nahaliel to Bamoth:20And from Bamoth in the valley that is in the country of Moab, to the top of Pisgah, which looketh toward Jeshimon.21And Israel sent messengers unto Sihon king of the Amorites, saying,22Let me pass through thy land: we will not turn into the fields, or into the vineyards; we will not drink of the waters of the well: but we will go along by the king's high way, until we be past thy borders.23And Sihon would not suffer Israel to pass through his border: but Sihon gathered all his people together, and went out against Israel into the wilderness: and he came to Jahaz, and fought against Israel.24And Israel smote him with the edge of the sword, and possessed his land from Arnon unto Jabbok, even unto the children of Ammon: for the border of the children of Ammon was strong.25And Israel took all these cities: and Israel dwelt in all the cities of the Amorites, in Heshbon, and in all the villages thereof.26For Heshbon was the city of Sihon the king of the Amorites, who had fought against the former king of Moab, and taken all his land out of his hand, even unto Arnon.27Wherefore they that speak in proverbs say, Come into Heshbon, let the city of Sihon be built and prepared:28For there is a fire gone out of Heshbon, a flame from the city of Sihon: it hath consumed Ar of Moab, and the lords of the high places of Arnon.29Woe to thee, Moab! thou art undone, O people of Chemosh: he hath given his sons that escaped, and his daughters, into captivity unto Sihon king of the Amorites.30We have shot at them; Heshbon is perished even unto Dibon, and we have laid them waste even unto Nophah, which reacheth unto Medeba.31Thus Israel dwelt in the land of the Amorites.32And Moses sent to spy out Jaazer, and they took the villages thereof, and drove out the Amorites that were there.33And they turned and went up by the way of Bashan: and Og the king of Bashan went out against them, he, and all his people, to the battle at Edrei.34And the LORD said unto Moses, Fear him not: for I have delivered him into thy hand, and all his people, and his land; and thou shalt do to him as thou didst unto Sihon king of the Amorites, which dwelt at Heshbon.35So they smote him, and his sons, and all his people, until there was none left him alive: and they possessed his land. What can you learn from the Israelites complaining? How did the bronze serpent foreshadow Jesus dying on the cross? How did God accomplish His purposes through Israel? How did Moses gain confidence that they would defeat Og King of Bashan? Sing a song with others about what God has done.